Background Proximal esophageal stents are poorly tolerated and have a high risk of complications. We report our experience using fully covered, biliary, self-expandable metal stents (B-SEMS) and narrow-diameter, esophageal, self-expandable metal stents (NDE-SEMS) for this group of patients. Methods 24 patients underwent placement of B-SEMS or NDE-SEMS for proximal esophageal lesions between 1 January 2011 and 31 July 2016. The outcomes included improvement of dysphagia, healing of fistulas, and adverse events. Results 10 patients received B-SEMS and 14 had NDE-SEMS. Median follow-up time was 11.5 months (range 0.5 – 62 months). In both cohorts, stents were left in place for a mean of 6 weeks. 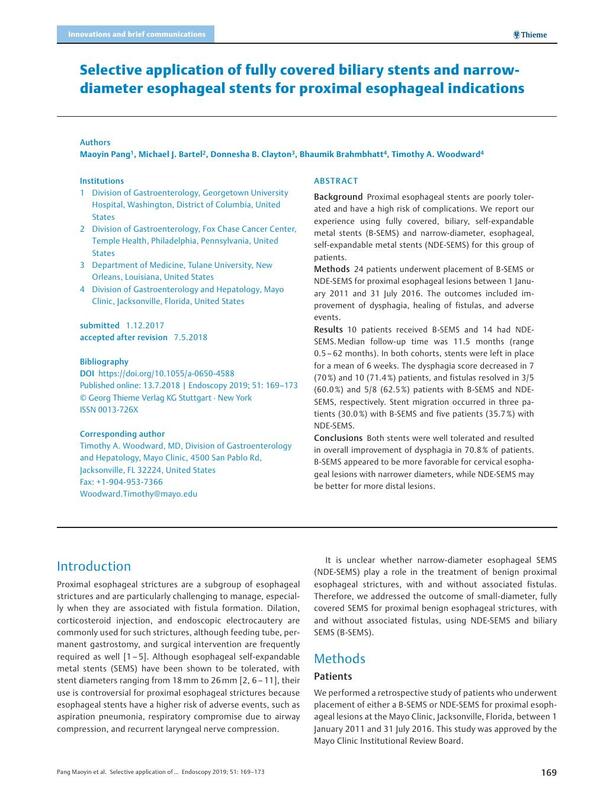 The dysphagia score decreased in 7 (70 %) and 10 (71.4 %) patients, and fistulas resolved in 3/5 (60.0 %) and 5/8 (62.5 %) patients with B-SEMS and NDE-SEMS, respectively. Stent migration occurred in three patients (30.0 %) with B-SEMS and five patients (35.7 %) with NDE-SEMS. Conclusions Both stents were well tolerated and resulted in overall improvement of dysphagia in 70.8 % of patients. B-SEMS appeared to be more favorable for cervical esophageal lesions with narrower diameters, while NDE-SEMS may be better for more distal lesions.